You’ll want to get under the covers with a flashlight for this one! 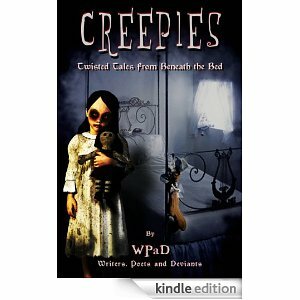 Enjoy these chilling stories and more in Creepies: Twisted Tales From Beneath the Bed. This creepy collection of short stories by various authors is a fundraiser for Multiple Sclerosis, in support of one of our writers, who lives with MS. 50% of all royalties will be donated to MS research. This is the same talented group (of my favorite authors, including my regular human alter ego) who brought you Nocturnal Desires!